The value of effective predictive/prescriptive analytics is easily explained: The best and largest storage capabilities, fastest data access and ETL functionality, and most robust hardware infrastructure will not guarantee success in a highly competitive market place. If, however, one can predict what will happen next – how consumer sentiments will shift, which large insurance claim provides opportunities for subrogation, or how specific changes in the manufacturing process will drastically reduce warranty claims in the field – critical actions can be taken yielding competitive advantages that could pay off within weeks or even days for the entire investment required to achieve those insights. I sometimes like to point out that I have predicted every stock market crash in the past 30 years – after they happened. Obviously, reporting on what happened to gain insight is interesting and perhaps useful, but the value of predicting outcomes and “pre-acting” rather than reacting to those outcomes can be priceless. I cannot think of a single successful business that is not continuously working to complete the value chain from the collection of data to predictive modeling, and automating mission critical decisions through effective prescriptive decisioning systems, i.e., some (semi-) automated system by which the best pre-actions to anticipated events and outcomes become part of the routine day-to-day operations and SOPs. There are near infinite numbers of specific examples. I have had the privilege of collaborating with some brilliant visionaries and practitioners on several books around predictive modeling, the analysis of unstructured data, and (in a forthcoming book) on the application of these technologies to optimize healthcare in various ways. These books describe the near-infinite universe of use cases and examples to illustrate what successful businesses and government agencies are doing today. 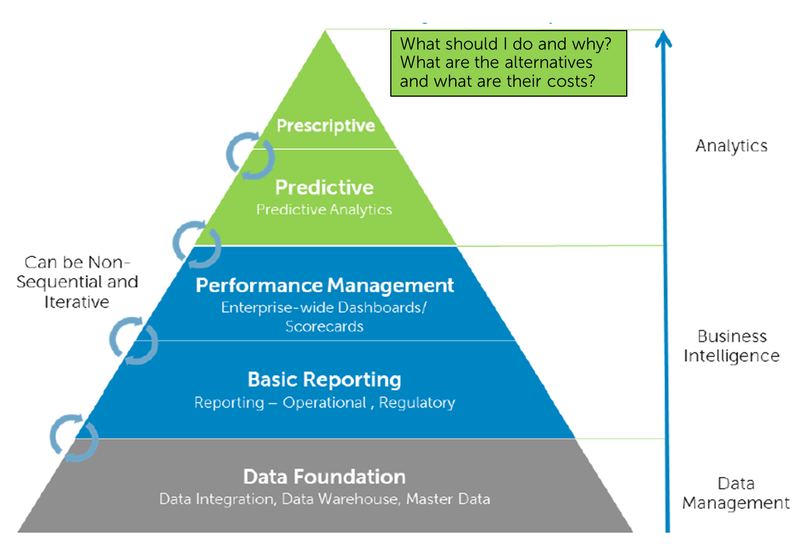 So what are the real challenges to adopting successfully predictive and prescriptive analytics? The biggest challenge in any such project – in order to incorporate these technologies into mission critical processes – is to complete successfully every single step of the value chain, from data collection, to data storage, data preparation, predictive modeling, validated analytic reporting, to providing decisioning support and prescriptive tools to realize value. There are near infinite numbers of ways by which well-intended and sometimes planned projects can drive off the rails. But in our experience, it almost always has to do with the difficulty to connect to the right data at the right time, to deliver the right results to the right stakeholder within the actionable time interval where the right decision can make a difference, or to incorporate the predictions and prescriptions into an effective automated process that implements the right decisions. Sometimes, it is an overworked IT department dealing with outdated and inadequate hardware and storage technologies, trying to manage the “prevention of IT” given these other challenges. Sometimes there are challenges integrating diverse data sources that span structured data in relational databases on premise, information that needs to be accessed in the cloud or from internet-based services, with unstructured textual information stored in distributed file systems. For example, many manufacturing customers of StatSoft need to integrate manufacturing data upstream with final product testing data, and then link it to unstructured warranty claim narratives that capture failures in the field stored in diverse systems. In the financial services industry, in particular the established “brick-and-mortar” players are challenged to build the right systems to capture all customer touch points and connect them with the right prediction/prescription models, to deliver superior services when they are most needed. So in short, the data may be there, the technologies to do useful things with those data exist (and are comprehensively available in StatSoft’s products), but the two cannot readily be connected. It is generally acknowledged that data preparation consumes about 90% or more of the effort in analytic projects. That is why we are excited at StatSoft to be part of Dell, and why our customers almost immediately “get it”: Dell hardware, combined with the cutting edge tools and technologies in Dell’s software stack, combined with Dell’s thought leaders and effective services across different domains, and now combined with StatSoft’s tools and solutions for predictive and prescriptive analytics deliver the only ecosystem of its kind that can integrate very heterogeneous data sources, and connect them to effective predictive and prescriptive analytics. It does not matter if, as is the case in the real world, these data sources are structured or unstructured, involve multiple data storage technologies and vendors, are implemented on-prem or cloud based. We can deliver solutions based on robust hardware with cutting-edge software and effective and efficient services, combined with the right analytics capabilities to drive effective action. So pausing for a moment to reflect on this, I cannot really think of any other provider of these capabilities that can complete the data-to-insight-and-action value chain for driving competitive advantages to all businesses small or large. StatSoft’s motto was “Making the World more Productive” which naturally goes with Dell and the Power to do more. This will be an exciting time going forward for StatSoft and Dell, and our customers.